MilesGallon.com adds new calculator for converting between US and metric gas mileage units. The calculator went live on January 6 and supports Liters Per 100 Kilometer (L/100Km), Kilometers Per Liter (KPL) and Miles Per Gallon (MPG) conversions. With the introduction of the new calculator for converting mpg to l/100km MilesGallon.com can now offer a total of 9 different automotive calculators. In addition to the metric/US fuel economy converter MilesGallon.com provides visitors with a total cost of ownership calculator that gives you the total cost per mile when expenses such as purchase price and insurance has been accounted for. There is also unit converters that let you convert miles to kilometers and liters to gallons, a tire pressure calculator, a quarter mile calculator for estimating the 1/4 mile time of a vehicle, and finally a trip mileage calculator that can estimate the cost of a trip given the miles and the mpg of the car. With fuel prices going only up and with the marketplace crowded with all kinds of fuel saving devices, many expensive and hardly proven to work, MilesGallon.com takes a different approach by helping ordinary people save gas by changing their driving habits. The gas saved by just a change in attitude can be as much as 10 percent. Translated to end of month cash this is a number big enough to make most drivers happy. Gas saving enthusiasts, often called hyper-milers, can save as much as 50% of the monthly gas by combining many gas saving techniques and vehicle modifications with a gas saving lifestyle. "To start improving your fuel economy you need to know what it is to start with" says owner Simon Byholm, adding that: "By checking your gas mileage, applying your new technique or vehicle modification, then re-checking your mileage you will know if the change improved your fuel economy or not." 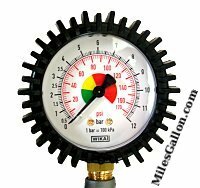 MilesGallon.com provides drivers with an online gas mileage calculator combined with tips and tricks on how to improve the gas mileage of their existing vehicle. The gas mileage calculator lets drivers enter a distance driven and the amount of fuel used to calculate the MPG of the vehicle. Add the fuel cost per gallon and the calculator will also give the cost per mile. With an option for Imperial gallon the calculator can be used for US as well as Canadian drivers. "We also work with European and international drivers by providing a metric mileage calculator using kilometers and liters" says owner Simon Byholm and adds that "The metric calculator has been more popular than initially expected."